Well-balanced sound with excellent wide area dispersion define a new class of ceiling speakers. 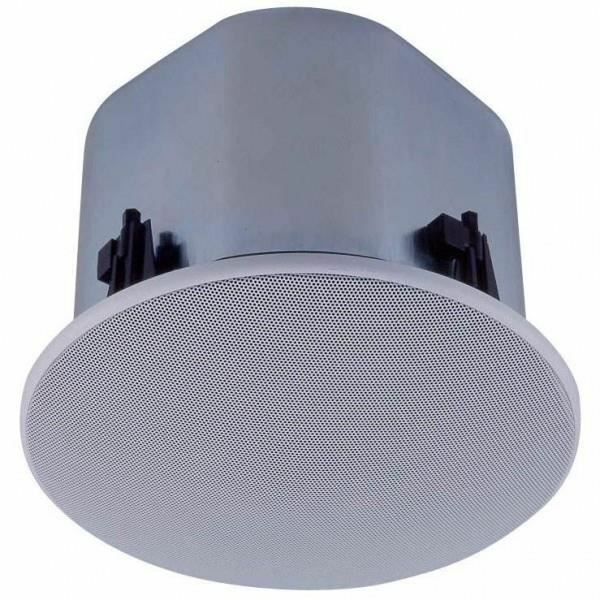 The Z-2852C ceiling and wall-mounted speaker covers an extremely wide area and can be used for 25, 70 and 100 V line applications. Well-balanced sound can be heard uniformly at any location. Designed to blend into ceilings with a smooth, low-profile design. Extra ease of use and higher cost-effectiveness with the metal "back can" enclosure for the speaker rear. Minimal high frequency rolloff allows clear and well- balanced sound reproduction over a wide listening area. Quick and easy installation to precisely mount speaker onto ceilings and walls. Rotating front grille also installs quickly and conveniently. TOA ZV-303 30 watt Volume Control for Ceiling SpeakerTOA ZV-303 attenuator adalah volume control yang menempel pada dinding menggunakan sebuah transformator yang memungkinkan koneksi dari berbagai beban (di bawah 30W). Volume dapat disesuaikan dalam lima langkah..
TOA ZS-102C Multichannel Power AmplifierRated Input Selection/Impedance : 10W, 5W (100V line)Frequency Response : 150 ~ 10.000HzSound Pressure Level (1W/1m) : 90dBSpeaker Components : 2 units 12 cm Dynamic SpeakerDimensions (WxHxD) : 167x335x141 mmWeight : 3.4kgMaterial : Extruded Aluminum casi..
TOA ZS 645R Ceiling SpeakerRound flush-mount 12cm speaker. # Screw-in installation. # Variable impedance. # 3W (70V line) or 6W (100W line) rated inputs. # 191mm off-whiteABS resin baffle.Type :flush ceilling MountRated input :6 WRated (Input selection/Impedance : 6W,3W,1,5W,0.8W(100V line )Frequenc..
TOA ZS-202C - Multichannel Power AmplifierRated Input Selection/Impedance : 20W, 10W (100V line)Frequency Response : 150 ~ 10.000HzSound Pressure Level (1W/1m) : 93dBSpeaker Components : 4 units 12 cm Dynamic SpeakerDimensions (WxHxD) : 167x580x141 mmWeight : 5.1kgMaterial : Extruded Aluminum casing..